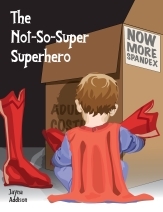 Kids and Superheroes… and Costumes? It occurs to me now that I should have asked those kids in April’s class for better superhero names. They had far better imaginations than I ever did. They could have come up with something great for me and my pathetic power. They did draw some very amusing pictures, after all. Talented little pipsqueaks. “It really is a shame that you can’t fly,” April observed, looking at the drawing with a smile. She set it down on the table, passing it over to Clayton. He shook his head as he looked at it. He had a cape and could fly, and he was carrying her with him. At least, that was what he thought the drawing was. It was kind of hard to tell with the crayons and shaky lines and all. She started to say something else, but he cut her off with a kiss. “Yeah? Cool. I’m so going to do that. It’s going to be amazing,” Larabee said, reaching for the drawings as he got up, almost running out of the diner in his hurry to get back to his lab. “Oh, I can make it easy,” April told Clay, pulling him in for a kiss.